Throughout his career as an artist, Édouard Manet made a number of prints that were direct replications from his earlier paintings. While the prints were not always intentionally altered from the paintings, a new look and feeling was always created through the prints. When discussing art the term emulation is often used, and it means to imitate or reproduce. 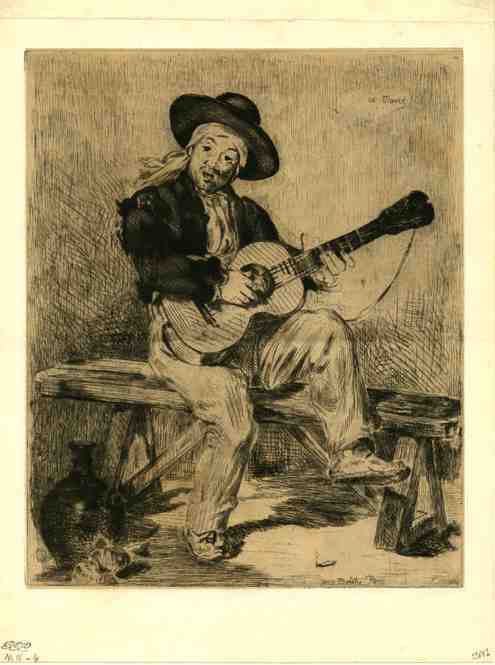 In both prints Olympia (1867, Print, Mead Art Museum at Amherst College) (Figure 1) and The Spanish Singer (Le Chanteur ou Le Guitarero) (1861-62, Print, Mead Art Museum at Amherst College) (Figure 2) Édouard Manet resorted to emulation and repetition to create new forms of representation. 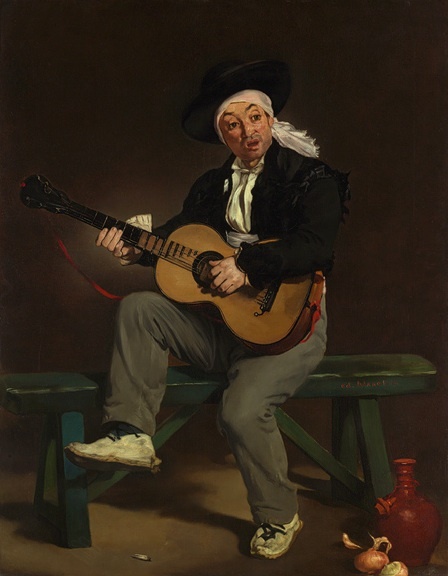 In both Olympia and The Spanish Singer Manet is emulating himself, going back and re-doing his own paintings in a way that changes the representation of the artwork. 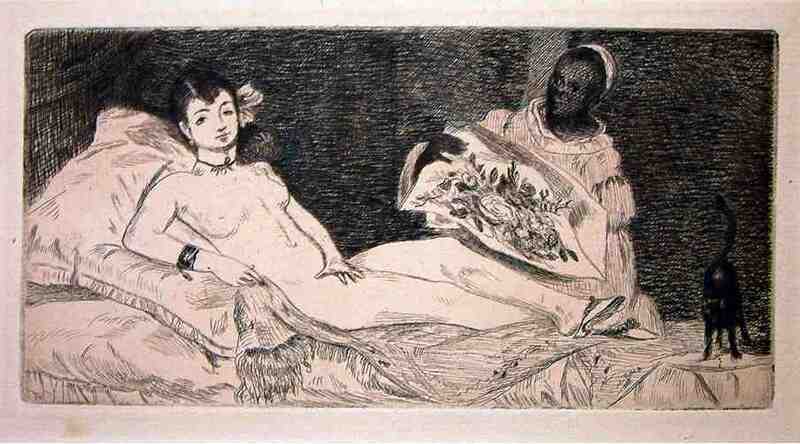 These prints not only have alterations that Manet created, but also have alterations that were created by the print. This gave Manet what he needed to create new representations of form, light and movement. By giving a detailed analysis of the two prints by Manet, the changes that are created when a subject matter is transformed from a painting to a print can be discovered. This analysis will prove how new representations of form, light, and movement can be seen in these prints. The prints Olympia and The Spanish Singer can be used to support this argument if they are not only examined, but if they are also compared to the oil paintings they originated from. It is clear that a majority of Manet’s works interpret his own design, originally motivated to create prints by a desire to popularize his art, using the print as a means of verbal communication (Fisher, 1985, 15). However, this does not mean that this was his sole motivation for emulating his paintings and creating prints.